Recently, we were featured in National Tank Truck Carriers Truck Tank University Webinar series to talk about the importance of Building a Driver Brand to overcome the growing driver problem. Read the summary below to learn a few key takeaways. The days of simply posting a job online and landing qualified applicants are long gone. Today, you have to “pay-to-play.” But tomorrow, you’ll have to pay even more! Indeed, Facebook and most jobs boards have embraced the algorithm auction format of Google AdWords. They picked up on the industry’s desperation for drivers and realized you’d spend about anything to find more candidates. So, they pit you against everyone else and escalate their click fees to drive up their profits. 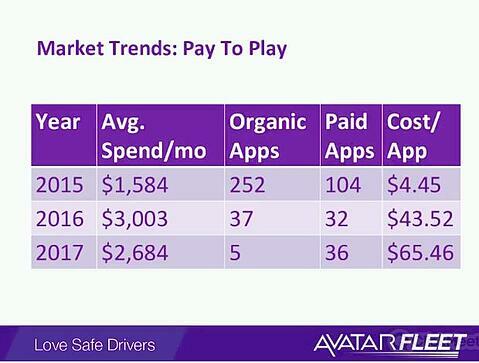 The chart below shows one company’s dramatic increase in cost-per-application over the past three years. Their advertising budget remained relatively stable, but the number of qualified applicants dwindled and the cost per application skyrocketed. Sadly, this is only going to get worse. Start with a Purple Cow. You have to find a way to stick out from the crowd. The best way to stick out in sea of nearly-identical driver advertisements is to take Seth Godin’s advice and become a Purple Cow. A Purple Cow is the kind of marketing that turns heads. It grabs your audience’s attention. Purple Cows are Great - But How Do I Start? Award-winning advertisements attract applicants who will like the jobs you have to offer – applicants who will most likely stay with you long-term. Start by creating your Driver Personas. Conduct driver stay interviews and meet with your senior drivers. What are they all about? Why have they stayed loyal for years and years, while so many others have come and gone? What do they like about you and your business, the freight you haul, the trucks you buy or the lanes you run? These questions pull out a deep understanding of who your long-term drivers are as people. They help you uncover their values, motivations and personalities. This data helps you create a powerful marketing and recruiting message that resonates with drivers who are most like your senior drivers. In the webinar, we discussed Transmark and K-Limited, two of our friends who have gone through the process of creating their own driver personas. Through stay interviews and one-on-one meetings, we helped them categorize their drivers into different personas. The personas led to targeted messages for each type of person. As an added bonus the interviews strengthened rapport with their drivers, who were grateful to have a voice at the table. Quotes from the senior drivers became part of the recruiting message used in future ads. The targeted advertising improved applicant quality and job-fit because it spoke to the type of person most like their senior drivers. When you interview your senior drivers, use Post-It notes to document three to five reasons why a driver would join you and stay with your company (one reason per Post-It). Don’t attempt to do this yourself. You’re not qualified. Only your senior drivers are. Get a few reasons from as many drivers as you can and post them on the wall. Look for common themes and move them around until they fall into their natural categories. Next, study your competitors ads, websites and trucks. Document their claims on Post Its, using a different color paper. Put them side-by-side with your claims. What’s different? That becomes the foundation for creating your driver persona and claims. It’s your purple cow. Being special and having jobs that are better than your competitors doesn’t do you much good, unless you have a way to prove it. You need to make your internal reality visible to the outside world. You can do this by creating Review Pages. These are the modern-day equivalent of word-of-mouth. Prospective drivers evaluate if you’ll live up to your purple cow claims by reading your Review Pages. Start by creating a Review Page on your website based on the information you got from your stay interviews. Then, ask your drivers if they’ll say those nice things about you on Facebook, Google, Indeed, etc. If you have a solid driver referral bonus in place, which you should, your drivers will be incentivized to leave a positive review. But don’t underestimate your drivers – they’ll post positive reviews without an incentive if you ask them, just because they’re nice people.